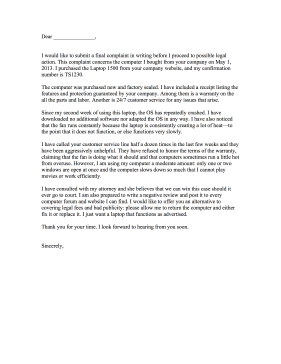 This tech complaint letter serves as a final demand for computer repair. I would like to submit a final complaint in writing before I proceed to possible legal action. This complaint concerns the computer I bought from your company on May 1, 2013. I purchased the Laptop 1500 from your company website, and my confirmation number is TS1230. The computer was purchased new and factory sealed. I have included a receipt listing the features and protection guaranteed by your company. Among them is a warranty on the all the parts and labor. Another is 24/7 customer service for any issues that arise. Since my second week of using this laptop, the OS has repeatedly crashed. I have downloaded no additional software nor adapted the OS in any way. I have also noticed that the fan runs constantly because the laptop is consistently creating a lot of heat-to the point that it does not function, or else functions very slowly. I have called your customer service line half a dozen times in the last few weeks and they have been aggressively unhelpful. They have refused to honor the terms of the warranty, claiming that the fan is doing what it should and that computers sometimes run a little hot from overuse. However, I am using my computer a moderate amount: only one or two windows are open at once and the computer slows down so much that I cannot play movies or work efficiently. I have consulted with my attorney and she believes that we can win this case should it ever go to court. I am also prepared to write a negative review and post it to every computer forum and website I can find. I would like to offer you an alternative to covering legal fees and bad publicity: please allow me to return the computer and either fix it or replace it. I just want a laptop that functions as advertised.